..come possono convivere capi le cui fattezze sono agli antipodi per mood, forma e vestibilità? Biker jacket e ankle boots capostipiti di un twist rock, mentre plissè e blusa in seta appartenenti al più impeccabile e grazioso bon ton. Mixando stili e scompigliando i capelli..ecco l'unico dettame modaiolo a cui mi piace aderire: self styling e grandi contrasti, attraversando i trend della stagione alle porte, come le tonalità del blu e del verde, lunghezze ladylike ed una cascata di borchie, il nostro gioco preferito diventerà di certo interpretare, mescolare e osare..
can clothes whose features are opposite in mood, shape and fit live together? Biker jacket and ankle boots founders of a rock twist, while plissè and silk blouse belong to the most impeccable and charming bon ton. Mixing styles and ruffling hairs .. here is the only fashionable dictat that I like to join: self styling and great contrasts, through season trends, as the shades of blue and green, ladylike lengths and a cascade of studs , our favorite game will certainly become playing, mixing and daring .. I think it's good to mix styles, you've really pulled it off Sabrina! Love this outfit, the colours are amazing! amo questi contrasti quindi non posso che approvare! La giacca la amo alla follia! Mi piace anche la camicia ma la gonna non so non mi convince. cute outfit love the touch of rock in your look!!! Love the jacket! Great combo! i love this outfit! its perfect! mi piace tutto .. hai creato un mix perfetto! Bellissimo abbinamento :D love it! Uno dei tuoi look migliori! adoro la gonna!!! Bello, un outfit diverso dai soliti che si vedono in giro :) complimenti! Mina. For me, that totally works! I think that we shouldn't dress to fit in a certain box. Dressing out of the box is what works for me in any case. Your outfit is a great example of how one can mix and match between different styles. And it looks good. And to be honest, what's more appealing than mixing good girl and slightly less good girl clothes? 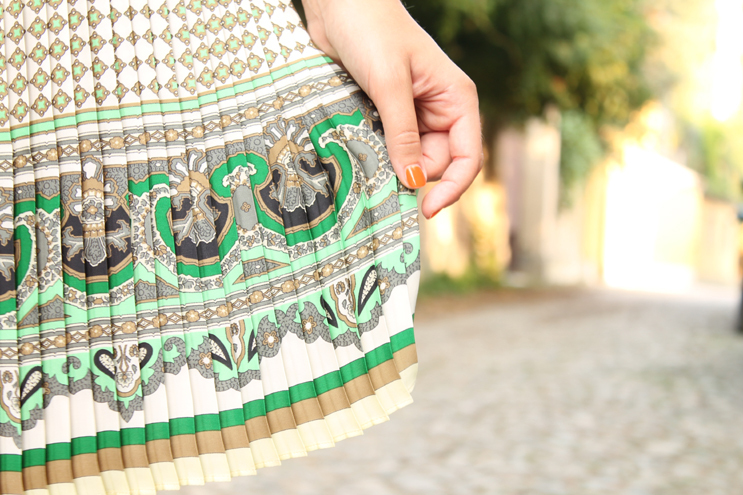 The skirt is beyond gorgeous! mix molto bello! !la gonna mi piace tantissimo!! !sei uno splendore !!!baci!!! abbinamento insolito :) che dire..approvo!! This is such a great post, I adore the colors in this outfit! There's a new post up on my blog and I'd love to hear what you think of it, so feel free to stop by! se avessi i fianchi stretti comprerei quella gonna! ma a me le piege stanno malissimo! Your jacket is amazing and your skirt is so pretty! stupendo! 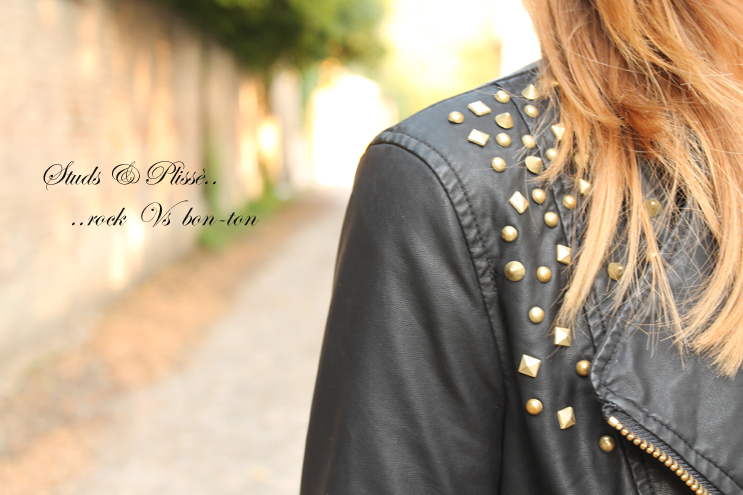 adoro il contrasto tra rock e bon ton! thanks girls:)happy u like it!! This is the first time I see your blog and I really like it, so I started to follow you. Beautiful colours combination, amazing skirt and bag!! !